Years ago I belonged to a computer knitting group that occasionally had a drawing to give away items in its “treasure chest.” These items were things that members of the list donated and consisted of yarn left over from projects, yarn the knitter decided she would never use, various knitting tools, etc. All in all it was a pretty nice treasure chest. One month, I was one of the winners. I was instructed to look at the inventory of items in the chest, choose which item I wanted, and e-mail my choice to the person in charge of the treasure chest. When I looked in the virtual chest, I saw that there was a ball of Rowan Kid Silk Haze, known to many knitters as “Crack Silk Haze” because knitting with it is so addictive. I had never even seen Kid Silk Haze in person, let alone knit with it, so you can imagine my excitement. Here was my opportunity to try one of the most talked about yarns in the history of knitting without having to shell out the big bucks for it! To say I was keen to try it is a gross understatement. 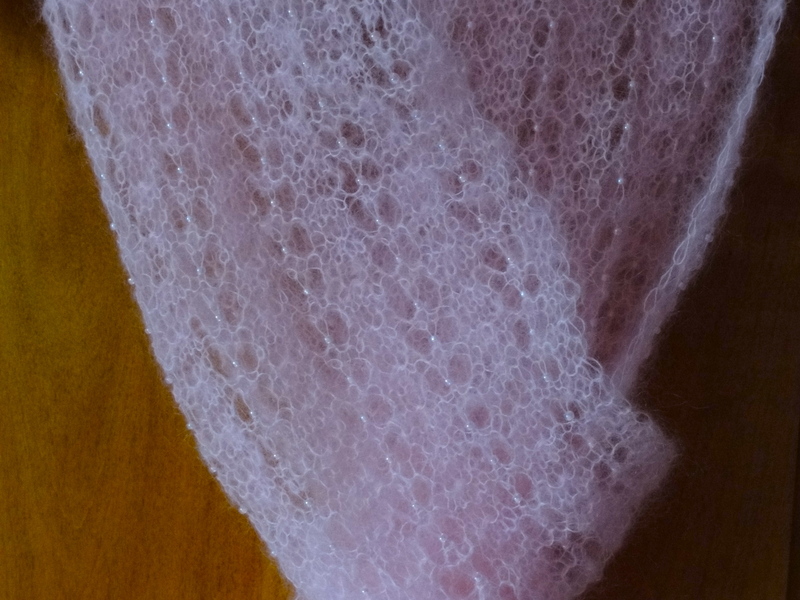 Needless to say, I chose the KSH, but added that if it was no longer available–after all, there were two other winners who were also choosing–my second choice was the light pink Filatura Di Crosa Kid Mohair. When my package arrived, I was a little disappointed that it didn’t contain the KSH. But it did contain three balls of very soft, light pink, fuzzy mohair. I had no idea what I would do with the mohair, but one of the beauties of nice yarn is that it doesn’t go bad, as long as you store it properly. I knew that the knitting goddesses would inspire me when the time was right, so I happily added the Kid Mohair to my yarn stash. The Kid Mohair had marinated in my stash for quite while I remained uninspired. Then I bought some nice pink Jade Sapphire cashmere to make a pair of mittens, and I just knew the mittens would be perfect if I knitted them using a strand of the cashmere and a strand of the mohair. Nice, soft, fuzzy mittens resulted. But I still had over 2.5 balls of Kid Mohair stashed away. It was time to wait for more inspiration. You never know when or from where knitting inspiration will come. Fast forward to December, 2011 and my bead-buying frenzy. Picture a tube of Miyuki 8/0 round seed beads in pink-lined crystal. “Oh, wouldn’t these beads look lovely worked into a nice, lacy scarf?” the knitter in me thought as I looked at the tube of beads. “And I have just the perfect yarn to go with these lovely pink beads.” Yes, the pink Kid Mohair had finally found its purpose in life. 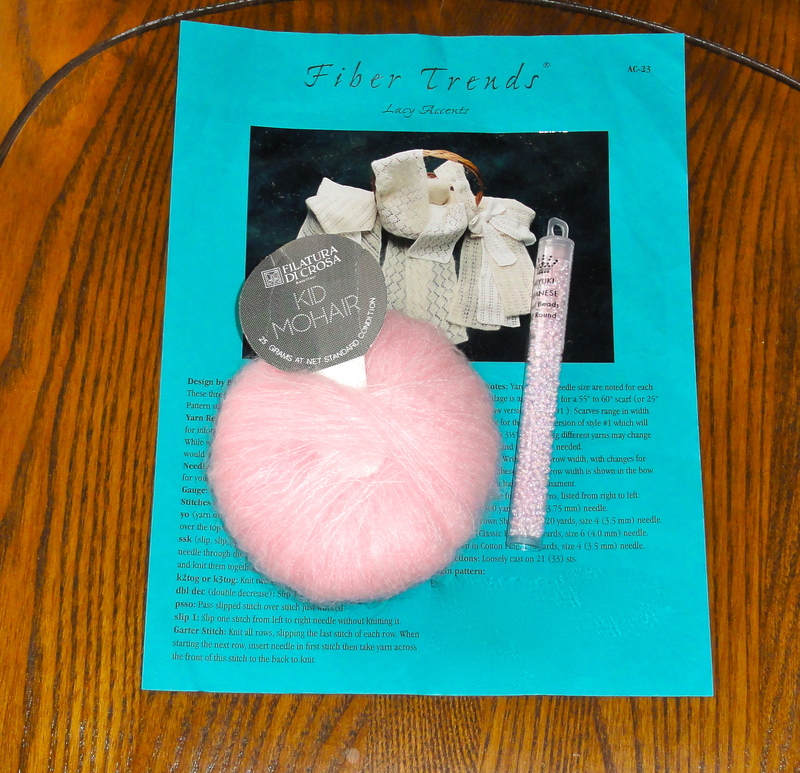 I dug through my stash and found the fuzzy pink mohair, got the beads out of their storage box, then went through my pattern notebooks to find the lace scarf leaflet, Lacy Accents from Fiber Trends, that had the perfect pattern. The leaflet has three lovely lace scarf designs by Bev Galeskas, and one of them, Simple Elegance, was exactly what I had in mind. I went to work and knitted and knitted and knitted. 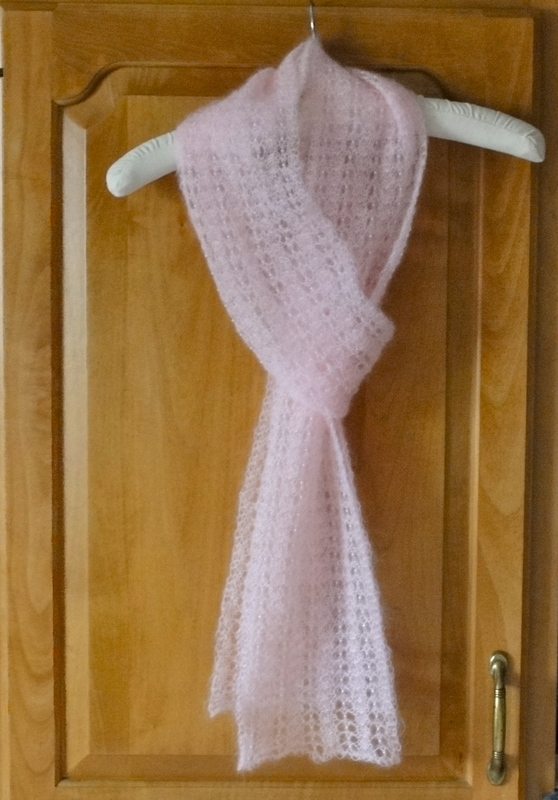 The pattern is a very simple one, and because it is garter stitch, it is totally reversible. I attached each bead with the crochet hook method, which means I didn’t have to pre-string hundreds of beads and push them along fuzzy mohair. That would have been a terrible PITA. with very subtle beaded accents. I’m very impressed with the quality of Miyuki beads. There was only one unusable bead in the entire tube. One of these days I’m going to buy some Kid Silk Haze and see what all the fuss is about. I swear. This entry was posted in Knitting, lace scarves and tagged 8/0 round seed beads, beaded knitting, Kid Mohair, Kid Silk Haze, lace scarf. Bookmark the permalink. This is beautiful. I have not done much work with beads, but this is absolutely (I hope I spelled that right) beautiful. Thank you. I’m somewhat of a bead newbie myself. For me, beads are an acquired taste. I didn’t care much for working with beads the first couple of projects, but now I really enjoy them.